I'm very happy to welcome Jenny Bravo from Blots & Plots to this years line up of presenters. 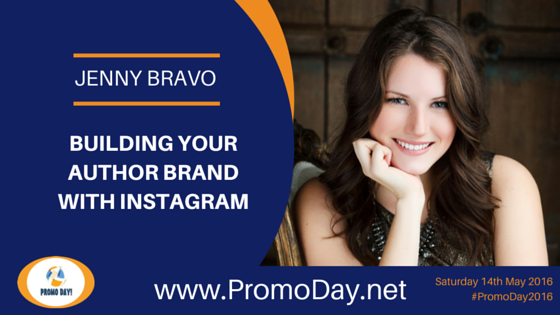 Jenny will be presenting a webinar "Building Your Author Brand with Instagram" on Saturday 14th May during the Promo Day 2016 event. Jenny Bravo is the founder of Blots & Plots, a motivational website for up-and-coming writers. She is the contemporary fiction author of These Are the Moments and used her blog to chronicle her publishing journey, offering personal anecdotes and guidance for writers. She loves confetti and drinks too much coffee. Want to know the secret to a killer Instagram profile? This webinar is for you! Jenny Bravo will walk you through how to create a stunning and approachable profile that will leave readers wanting more. We'll explore topics such as theme, captions, and challenges. By the end of this, you'll be Instgramming with the pro's!